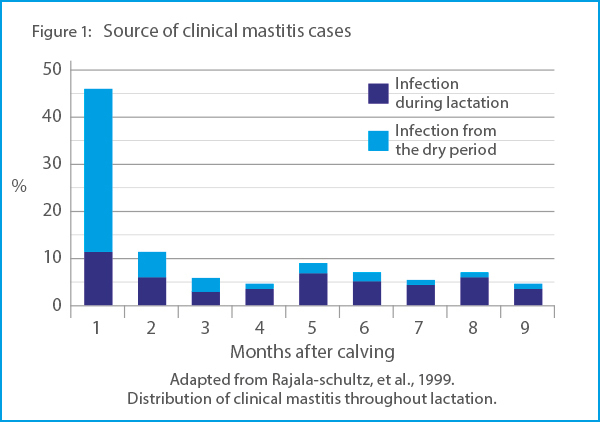 With the cost of a case of clinical mastitis in the region of £322 and 50-60% of all new infections caused by environmental pathogens picked up during the dry period, then mastitis control in the dry period should not be the poor relation in your herd health program. Managing dry cows and in-calf heifers especially during the summer months can be a minefield. As traditional dry cow antibiotic treatments continue to come under increasing scrutiny and the use of internal teat sealants is questioned by some milk buyers then effective, reliable alternatives are being sought by many. An alternative or complement to these traditional treatments is T-Hexx Dry, a non-antibiotic external sealant that is applied at drying off. As with traditional treatments, great care should be taken whilst applying T-Hexx to ensure that teats are cleaned prior to application and that the product is not reused between cows. 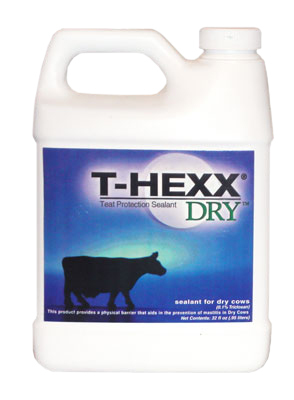 If using to support traditional dry cow therapy or internal sealants then T-Hexx is applied as the final step in the drying off routine. T-Hexx Dry is applied externally as a dip forming a thick, flexible, waterproof but breathable film and because it is applied externally, leaves the naturally formed keratin plug intact in the teat canal. T-Hexx Dry takes around 10 minutes to dry but once dry, it forms a flexible barrier that can discourage nuisance flies and help support the teats natural defence mechanism, especially in the early days of the dry period when udders are at more risk. It remains on the teat for around 7 days and can be re-applied in the last two weeks of the dry period when the keratin plug begins to weaken. T-Hexx Dry also has the advantage of being non-invasive, helping to avoid new infections at application. It is also perfect for quick and easy use for in-calf heifers where there is a large population of biting flies. 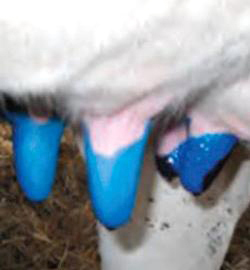 At a cost of less than £1/cow per application then T-Hexx Dry offers you an economical, visible, external non-antibiotic barrier and can be purchased from your local agricultural retailer without prescription. For more information on T-Hexx Dry or to find a local stockist please contact us.